I am constantly thinking about how to make maps and data more focused on people, their stories, and the impacts that those numbers represent. 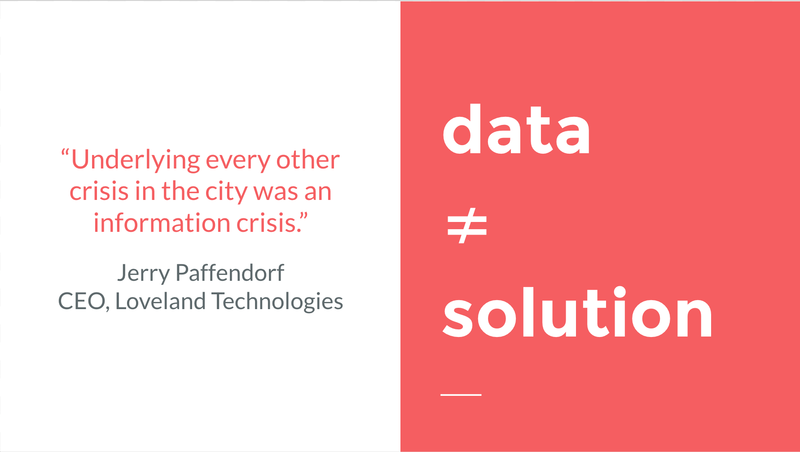 It is a constant battle working with data and numbers every day and one that is most often overlooked by organizations that are focused on utilizing big data and attempting to turn a city around. Earlier this year I spoke to a group of public administration and policy students on Data and Detroit: The Need for People Centered Innovation. This is the content of a recent talk that I gave at the launch of Open Data Windsor-Essex. Detroit has recently become overwhelmed with people interested in its problems and the data that accompanies those problems: $18 billion in debt; 380,032 blighted properties; 70,500 foreclosures; 8,000 occupied homes headed to the property auction, evictions imminent. 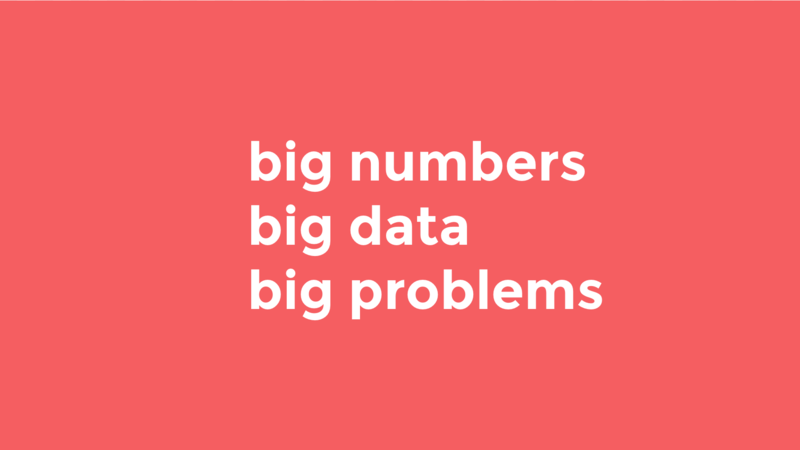 Big numbers, big data, and big problems. There is a growing set of psychological research that demonstrates how big data is dehumanizing: companies hide behind algorithms, numbers associated with mass atrocities don’t spur action, and we have become detached from the people who represent those numbers. 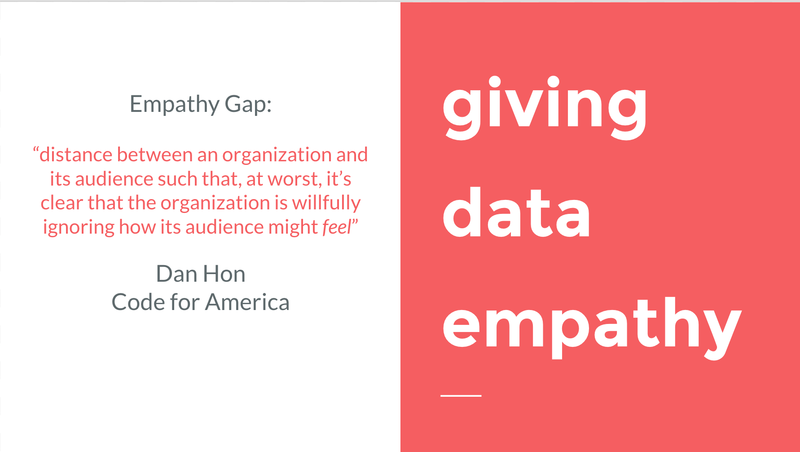 Open data is a critical movement that is a must-have for anyone who hopes to impact people’s lives with data, the next step of that movement is to join data with empathy for people-centered innovation. Detroit’s bankruptcy, warranted or not, threw Detroit’s data in full view of the national media. Where did the bulk of the deficit come from? Where were the biggest cuts going to happen? How many retirees would lose their pensions? How many people don’t pay their taxes? How many overdue bills does Detroit have? Once the media jumped on the Detroit bankruptcy wagon, the related problems began cascading through the headlines. At the fore was Detroit’s “Hurricane without Water” – a man made crisis of epic proportions, the Wayne County Property Auction. Year after year the county auctions homes the majority of which fail to be paid for and thus return to the auction in following years. It actually cost the county more money to run the auction than the revenue that it generates. That all goes without mentioning the thousands of Detroit residents who face potential eviction from their homes as a result of subprime lending, improper management, worthless landlords, or compounding issues from Detroit’s history of mismanagement. It is fairly easy to find data about Detroit and create seemingly beautiful visualizations of its problems, but the data in and of itself doesn’t tell a story and doesn’t give full context as to how these big problems impact people. Some have tried to say that Detroit has been operating from an information deficit, however I would argue that the main problem was that no one was utilizing or analyzing the data that existed, which in many cases meant that the data wasn’t even being collected. Those hoping to create the solutions weren’t using all of the available tools. Simply beginning to collect that data and share it on an open platform is an important step, but is not a solution in and of itself. Open data is a baby step among many as we move towards more accountability in government, non-profits, and other sectors. Detroit’s water crisis is a perfect example of the downfall of data. The city knew that it had 150,000 outstanding water bills that totaled over $118 million. The city quickly developed a plan, hired a contractor, and began shutting off people’s water for non-payment. The first round of shutoffs started without any notice or communication. Some people who had even kept up their water bills faced shutoffs because the contractors were just shutting off entire streets. After national and international backlash the city attempted to better communicate the problem, but again largely failed as water affordability was still non-existent. Overall, 25,000 people signed up for water payment plans, but due to the continued unaffordability only about 300 remained active. In a city where there is 20% unemployment, 40% living below the poverty line, and a 50% jobless rate – I’d really like to know what the City of Detroit thought was going to happen. Punitive measures against the poor represent the greatest failure of a city and the misuse of readily available data. If you can fund contractors to shut off water, then you can fund canvassers to go door-to-door with information about assistance programs, etc. What are the people’s needs (user needs)? An empathetic service would ground itself in the concrete needs of concrete people. Lauren Hood at Techonomy 2015 reminded the audience full of tech leaders, startup CEOs, and other innovators that they can’t hope to impact Detroit by talking about tech without the people who would most benefit from those innovations. We’ve come to think that the next app, data aggregator, or web map (line up the buzzwords: big data, information age, government-as-a-platform, transparency, crowdfunding, open data, civic tech) will change the world – but it is people who change the world with data, not vice versa. We must learn to prioritize people and their needs as we push open data. Data is often about fast responses and short timeframes for launch. Prioritizing people takes more effort and more time, but we must refocus or we will be lost among the tabular data. In 2007, I was engaged in efforts to raise awareness about the genocide in Darfur. It was easy to get people involved on college campuses for a while, but issue fatigue quickly took hold. There were 3 million people displaced; 300,000 killed – This became a common theme in my undergraduate studies in international relations. I was regularly engaged with the work of international nonprofits and NGOs, many of which had mastered the art of fundraising based on a single tragic picture rather than big numbers. Constantly listing the 6 to 7 figure numbers associated with tragedy quickly wears down any personal or institutional resolve, but that doesn’t mean we ignore the numbers. Big numbers don’t motivate action, they have the completely opposite effect. We become “numbed by numbers.” The recent New York Times piece on “How Syrians Are Dying” is a good example with one person representing one pixelated dot on the screen. The big numbers that we have in Detroit continue to build and are constantly repeated, but not much has changed (i.e. foreclosure crisis). Thinking about the “big numbers numbing effect,” it is no wonder that we have gotten lost along the way especially as leadership pushes “revitalization” often without engaging or asking people what they need in their neighborhood. Nothing is more important than giving data context. Spreadsheets are great for compiling, but not very helpful in understanding data or being persuaded by it. The majority of data that we see isn’t shared in raw form for that very reason. We often see data in dashboards, infographics, and other visuals. Typical economic theory relies on the assumption that humans are inherently logical decision-makers, but the reality is that we are more strongly influenced by emotion resulting in reflexive responses. Thankfully this often helps us be empathetic and act against our self-interest in order to help others. As much as compiling databases is the current norm, it is beyond critical that we find a way to show the faces behind the numbers. The following are some examples of storytelling (with or without data) that could be examples moving forward where data and stories can work together to give a more full picture of a problem. Two-thirds of Detroit residents have access to a car, but that data from the Census doesn’t encompass the difficulties associated with car ownership, insurance, maintenance, regularity of use, etc. It is no mystery that transportation in Detroit is in need of significant improvement. This most often comes in to play when discussing access to jobs, which are concentrated in suburbs without public transit. The highest estimates put Detroit’s jobless rate at 50% with 40% of people living below the poverty line. 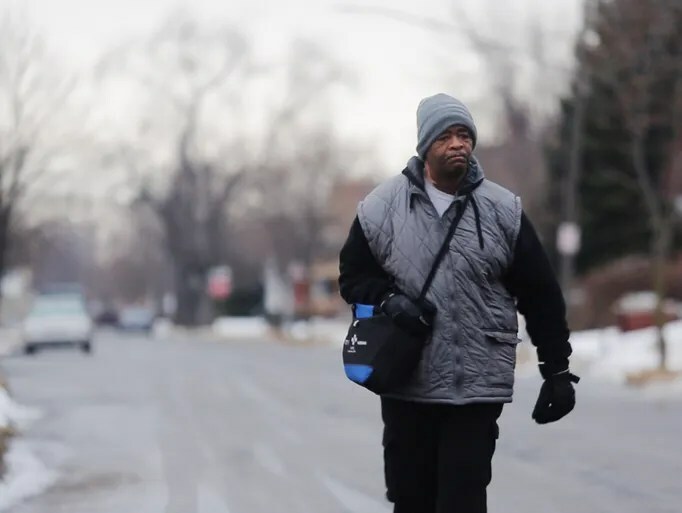 Roughly 300,000 people in Detroit could be jobless, yet the story of “the walking man” captured the attention of thousands of people. The walking man, James Robertson, lived in Detroit and worked at a suburban factory. He took the bus where it was available, but ended up with a 21 mile roundtrip walk to get to work. The power of his story raised $350,000 and a new $35,000 car. He noted that the money should go to the transit department, feared for his safety, and ended up moving to a new home in the suburbs. It wasn’t the big numbers that motivated people to act, but one person’s story. Tax foreclosure is an entire industry of big data, big numbers that often don’t reflect life stories. This year the Wayne County Treasurer identified 61,912 properties in Detroit for foreclosure in 2015. Loveland Technologies found that 35,669 of these properties (63%). People live here. Simply looking at the data with the enormous number of foreclosures or the amount of taxes due to the city is not enough. 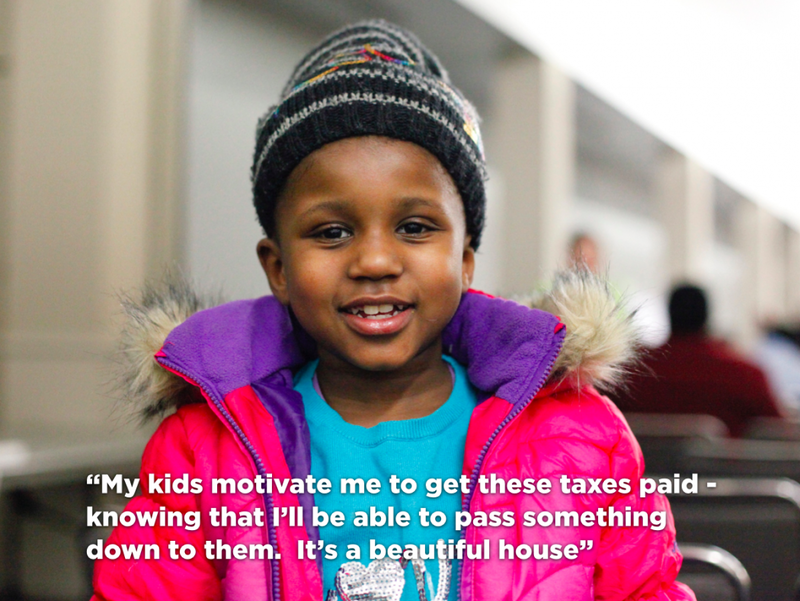 The partner groups working on the Motor City Mapping project worked together to talk to 71% of all of the 7,725 people who came to Cobo Center for the foreclosure “show cause” hearings. After completing their very data heavy parcel mapping and property categorization, they sought out data to humanize the tax foreclosure issue. They found that 83% of people were home owners and 88% of people wanted to be able to stay in their homes. By taking the time to answer questions, offer coffee and snack, or just be a listening ear – people were able to be placed at the center of a massive data effort. There need to be more of these types of mixed approaches and they need to be planned from the beginning. The latest celebrity of urban theory, Richard Florida, who has plugged his controversial “creative class” as the savior of rustbelt urban cores has also noted that people must be the focus of our work in cities. We can confer subsidies on places to improve their infrastructure, universities, and core institutions, or quality of life, but at the end of the day, people — not industries or even places — should be our biggest concern. If we aren’t using data to improve the lives of people then we are doing it all wrong.